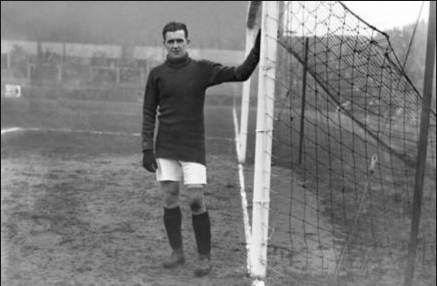 Brilliant goalkeeper from between the wars who actually ended up here as a result of being injured during World War 1 and then guesting for the club while convalescing. This eventually led to him transferring from Sheffield United for the hefty sum of £350. Hufton soon emerged as one of the best keepers in the country, despite playing for a Second Division side. He also attained a reputation as a penalty expert by saving eleven of the first eighteen he faced in his first two seasons. My immediate thought upon reading that was that our defenders apparently didn't take many prisoners back then. By 1923 a fine team had been assembled and they were duly promoted to Division 1, as well as reaching the FA Cup Final. In front of Hufton were the excellent Jack Tresadern and George Kay, while the famous trio of Billy Moore, Vic Watson and Jimmy Ruffell scored 54 goals between them that year. Hufton was considered every bit as good, and was eventually rewarded with an England cap in 1924 after missing out the previous season through injury. Because West Ham. Thereafter he remained an integral part of that excellent side, who retained their top flight status all the way through the decade, before eventually moving on in 1932. Impossible as it is to compare across eras, Hufton should absolutely be in any discussion about West Ham's greatest ever keeper. I'm prepared for a bit of a fight here, primarily because Parker wasn't with us that long, but I haven't found many who were so continuously excellent during their time at the club. Joining during the Icelandic splurge of 2007, he initially suffered some injury problems before returning to win Hammer of the Year for the next three seasons. He then managed the unheard of feat of being voted Footballer of the Year by the Football Writers Association as a Hammer. Only Bobby Moore achieved this while a West Ham player, and Parker's was even more remarkable as he did it in a relegated team. Sadly his spell coincided with a the banking recession and a prolonged period of asset stripping by the creditors of our former Icelandic owners. Only West Ham could have the best midfielder in the country and surround him with a cast of unknown signings from Italy, two blokes from the Red Lion and Benni McCarthy. Parker joined Spurs after a few early season appearances in the Championship, which seems to have soured the memories that many fans have for him. I don't understand this - his was a brilliant West Ham career amid a slurry of dross. It was hardly his fault that the club was so fundamentally broken in his time here. His stellar form continued right the way through to the 2012 European Championship when he was a starter as England were knocked out by Andrea Pirlo and Italy. As ever seems to be the case with West Ham, we had the right player but just at the wrong time. 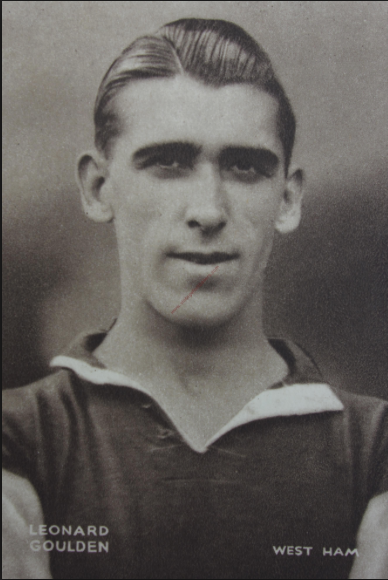 If Graham Paddon was the best West Ham player that I'd never heard of, then I might wager that Len Goulden is the best West Ham player you've never heard of. Jack Helliar and Tony Hogg explicitly state in their Who's Who of West Ham that Goulden "would inevitably figure highly" on any list of this nature. And that's good enough for me. Goulden was a brilliant inside left who linked closely with Jimmy Ruffell to offer most of West Ham's creative threat during his time. Despite playing primarily in the Second Division he was good enough to play regularly for England, and was even a member of the famous 1938 team who ignominiously gave the Nazi salute before their match in Berlin. He played regularly for the club during World War 2 but was chased by Chelsea after hostilities and was eventually allowed to leave to pursue his Division 1 ambitions for a fee of £5,000. Like Parker, Goulden would undeniably have had a better time with a better team to play in. A fine player from an era that produced many of them, Boyce was something of an unknown to me before this project, and indeed I remembered him more as a coach than a player. As with so many though, I discovered a very good player lurking behind the numbers. Not as talented as his more illustrious team mates, he was nonetheless indispensable as a result of his prodigious work rate and willingness to run constantly. Famously scored a last minute winner in the 1964 FA Cup Final to give us a 3-2 win over Preston North End, after a typically lung busting back post run, having already scored twice to see off the Manchester United of Best, Law and Charlton in the semi final. Not bad for a local lad. His career stretched on until the early 1970's, at which point he joined the coaching staff and even had a short stint as caretaker manager in 1990 before Billy Bonds took over. Most descriptions of Dicks would talk of a tough tackling left back, and while that is true it does rather underplay his considerable ability as a footballer. Quick and direct, he had a lovely left foot and was one of the rare players able to control a game from the full back position. His first stint with the club saw him sent off four times, before moving to Liverpool in exchange for David Burrows and Mike Marsh. He returned not long after, chastened and more mature after an unsuccessful stint at Anfield and soon established himself again as our best player. He would win Hammer of the Year on four occasions and legend has it he would have played for England if he'd only been prepared to grow his hair longer. Naturally. Dicks established a connection with fans as a resulted of his thoroughly committed performances, brilliant left foot, uncanny eye for goal and a willingness to play on after serious knee injuries. There can have been few better strikers of the ball to have ever played for us. Sadly, the end of his career saw a swift demise as he could no longer run properly, and he moved on in 1999. He returned as Slaven Bilic's assistant in 2015, although it was hard to know exactly what his role was. Teenage me is distraught that he is not in the Top Ten. If Dicks was thunder then Potts was serene sunshine. Small of stature he may have been, but Potts was West Ham's classiest defender since Tony Gale, and the backbone of the Nineties teams who eventually clawed their way to being an established Premier League side. He started as a right back and struggled to cement a place in the side with Ray Stewart ahead of him. It wasn't until he moved inside to a centre back role that he truly found his groove, as his near total lack of attacking ability was rendered largely irrelevant by his supreme reading of the game. Potts played at a time when it was customary to have two strikers up front with one being a target man and the other a smaller, nippier finisher and he excelled in nullifying that role. As such, his partnerships with Marc Rieper and Slaven Bilic were the main strength of the mid Nineties West Ham sides and he was duly rewarded with two Hammer of the Year awards and two runner up trophies too. Potts eventually lost his place to the emerging Rio Ferdinand, and played his final game in 2001. He sits seventh in the all time list of games played for the club, and isn't out of place amongst such legends. He remains at the Club in a coaching capacity, or at least that's what it says here - I'm not actually convinced there is anybody alive in our Academy. Another early legend, who again had a career disrupted by war but still scored at prodigious rate whenever called upon. He started initially in the Southern League and then continued scoring freely in the Wartime Combination leagues, including a Carlton Colesque 51 goals in his last 49 games. West Ham then stepped up to Division 2 after the war and he continued his fine form, which saw him earn his first England call ups. With his star on the rise, Puddefoot was hugely sought after by the top clubs and so naturally joined Falkirk for a world record of £5,000. As weird a move as that might sound, Puddefoot had actually spent time in Scotland during his war service and as such was highly regarded there. It is also true that football north of the border was at least the equal of the top English leagues at the time. In true West Ham fashion, Puddefoot returned in 1931 in a failed attempt to keep us in the top flight, before moving on at the end of the following season. He remains 8th in our list of all time top scorers, a mere 206 ahead of Steve Potts. Tremendous centre half who came through the youth system despite hailing from Liverpool. Martin was a physically imposing centre half who allied his aerial ability with an astute reading of the game and decent ball playing skills. He missed out on the 1982 World Cup through injury but made it into the Mexico '86 squad where he played in the Round of 16 game against Paraguay and then presumably thanked his lucky stars that he avoided Maradona in the next round. Although a defender, Martin was good for a few goals a season, and once achieved the unlikely feat of scoring a hat trick past three different keepers, in an 8-1 win over Newcastle in 1986. He displayed remarkable longevity to play on until the 1996 season, where he actually featured alongside Rio Ferdinand and Frank Lampard Jr. By that stage his mobility was roughly on par with Nelson's Column but that shouldn't detract from the magnificence of his overall career. The best of the modern goalscorers. Cottee was a diminutive but lightning quick striker who had the priceless ability to score goals from nothing. In many ways he wasn't dissimilar to Gary Lineker in that he wasn't necessarily a truly all round player in the vein of Johnny Byrne or Geoff Hurst, but his ability to sniff out chances and finish them was invaluable, and a key part of the 1985/86 season. 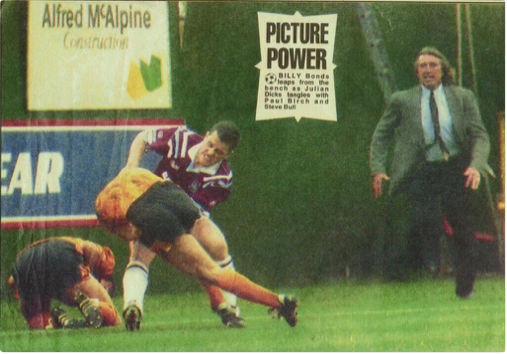 His partnership that year with Frank McAvennie was electrifying, with the Scot playing a slightly withdrawn role and seemingly acting as a second striker in supply of Cottee. 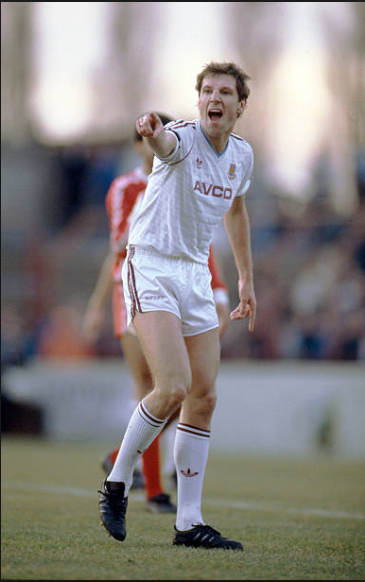 With his pace and movement, Cottee was difficult to mark, which in turn created space for oncoming runners such as McAvennie and Alan Devonshire to exploit. Considering the pitches and tackling of the era, it is testament to his toughness that he stayed largely fit through that period, and he ended up as Hammer of the Year and PFA Young Player of the Year. Cottee eventually got a deserved England call up shortly before leaving to join Everton in 1988. In fairly typical fashion he returned to the club for a second stint years later, and bizarrely got himself sent off on debut at Liverpool. He redeemed himself the following week with a winner at home to Aston Villa, and his goals would be a crucial factor in keeping us up over the next two seasons. Although that lightning first step had long since gone, he was still a deadly finisher and remains 5th in the list of our all time scorers. Pleasingly, he still seems as in love with the club as the day he scored on debut against Spurs as a 17 year old. Having watched several hours of YouTube clips in support of this piece I have decided to confess that I cannot tell whether Frank Lampard was left or right footed, such was his ability. From what I gather, he played primarily at left back and yet scored screamers with his right foot. I am going to go out on a limb and say that he was a pretty good player. The sheer length of Lampard's service is staggering and I was slightly surprised to find him second only to Billy Bonds in terms of appearances made. He was a regular from the 1969/70 season onwards and never played fewer than 30 games until the 1983/84 campaign. During that time he picked up two England caps, seven years apart, as well as two FA Cup winners medals and a runner up trophy from the 1976 European Cup Winners Cup Final defeat to Anderlecht. In that game he made a rare error to gift the Belgians an equaliser, and let them back into the game. He also somehow injured himself in the process, which really is top class West Hamming. 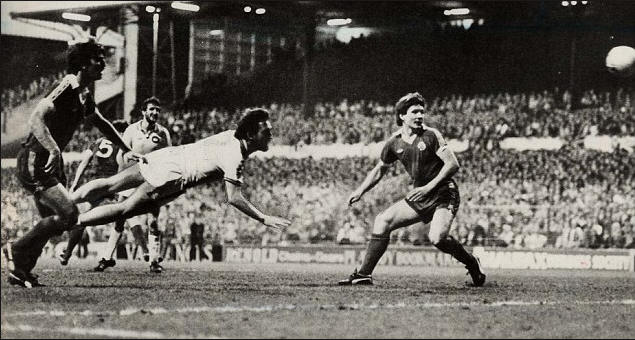 He redeemed himself five years later with his iconic FA Cup semi final goal against Everton at Elland Road, and his general calling card was one of extreme reliability and high octane full back play. After retiring, Lampard joined his brother in law Harry Redknapp as coach of the first team, and he helped to bring through Rio Ferdinand and his son, Frank Jr. After the latter left Upton Park under a cloud, Lampard Sr pretty much turned his back on the club in disgust at the treatment his son received. So, well done everyone involved there.